1. FIND YOUR OWN SUBSTITUTE! I have learned you will never know until you ask, so when I asked our principal if I could find my own maternity leave substitute, he was actually relieved to have it taken off his plate. I am lucky enough to live in a town with a university know for education, so my search was actually quite easy. I contacted former Spanish professors and asked if they knew anyone who was students teaching in the fall and would be free in the Spring (I was due in January), posted the opening on job boards, as well as posted it on the Iowa World Language Association Website. I was very fortunate to find a certified Spanish (& French!) teacher who finished his student teaching in December and needed something to do until he started his full time job in the fall, win, win all around! While at the IWLA conference in the fall I brought up maternity leave while sitting at lunch with a lovely group of ladies. 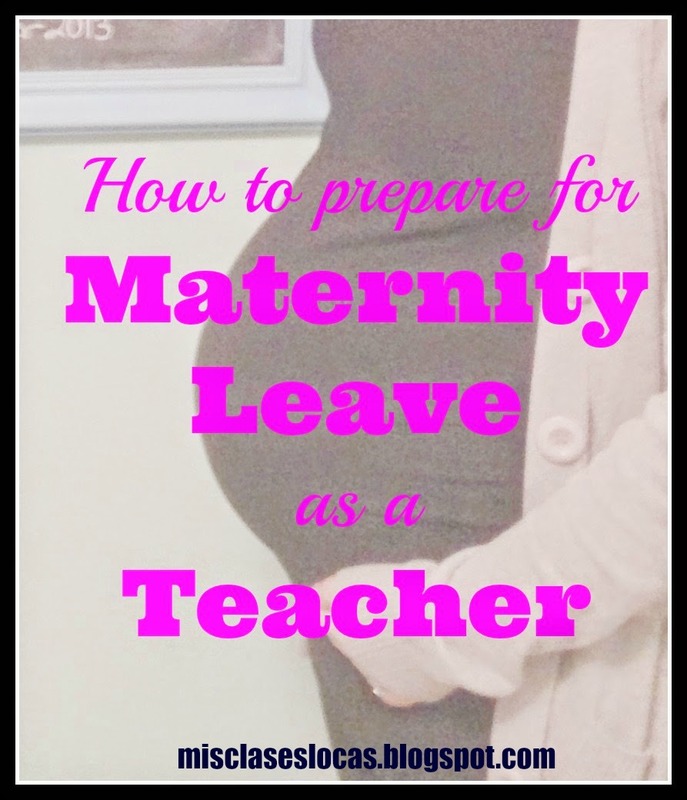 They had a variety of experiences from planning every single day of their leave and grading while at home, to letting the sub do whatever they wanted. What I learned from them was I did NOT want to spend my precious (unpaid!) weeks at home planning and grading. Once I knew I had a capable sub, I made an outline of what the sub would ideally cover, plus a ton of extra ideas, mini units, and activities if needed. I then left all day to day planning and grading up to him. And you know what?!? I came back and the students had met my goal for them, they learned and used Spanish. While in graduate school I substitute taught pretty much every subject and grade and you know what I took out of it? Have a detailed Substitute Binder and your sub will love you. This is something every teacher should have, whether you will be gone for an extended amount of time or not. There is nothing worse than being deathly ill, but having to stay up late typing up sub plan. 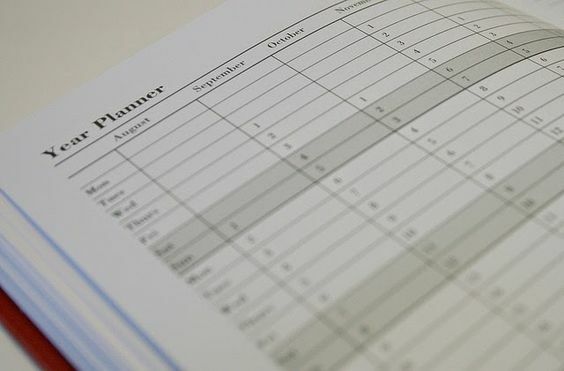 Have a detailed Binder, with emergency plans and activities all ready to go on your shelf, that way all you have to do if you are sick (or go into labor early) is tell your principal where your sub binder and extra plans and materials are. Once my substitute was lined up, I started flooding him with information. I set up a Google Drive folder sorted by level with all of the possible resources he could need or want for the unit they would cover. I also included TONS of extra activities, games and resources in a drive folder as well. I also created enough bell ringers for the time I was gone. You can download them here- Empezar. By talking him through everything before I left, I was able to relax once he started knowing that he had everything he needed to be successful. It will be alright. As teachers we are used to planning every minute, but in order to actually enjoy the time you are away, you need to step back and know that someone else can take over while you are gone. No, it will not be exactly like when you are there, but if they are hearing and using Spanish, then you have done your job. So far the most popular post on this blog has been about baile viernes, our routine of starting every Friday dancing to a Spanish song. So I decided to go into more detail with baile viernes' older sister - música miércoles. 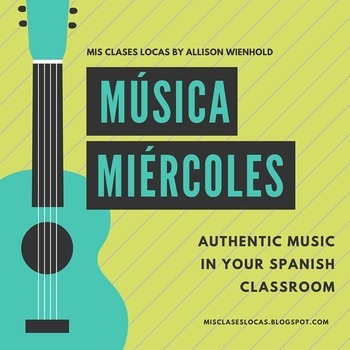 Música miércoles (music Wednesday) is starting class watching a music video (or lyrics video for those with inappropriate videos) of a current or classic song in Spanish and then answering questions or talking about it in Spanish. I recently started a Youtube playlist to keep class favorites organized. Here is the powerpoint of Spanish bellringers if you are interested in implementing them. Each week I pick either a favorite song of mine or one from Billboard Latino Top 100. I am always on the lookout for new music on Pinterest and Twitter as well, especially current and relevant, such as the World Cup. The students enjoy doing activities surrounding music so much that this year I think the entire class period will be dedicated to music on Wednesday. (Especially since due to Wednesday's short class period this year due to Mass, homeroom, and early release all fall in this day meaning around 27 minute class periods. After watching a video and talking about a little, there would barley be any time to do anything else anyway, so why not go deeper into the music?) If we are going to spend the whole class period on a song each week, I need to do a better job planning songs that would go with each levels' unit. In the past I have picked one song each week (for ease & planning sake) to show all levels, and varied the questions I asked each class. Or maybe I will mix it up, some weeks all classes will see a new great song, and other weeks, songs will vary by levels and topics being studied. We shall see! Update - You can now get ALL resources together in the Música miércoles GROWING BUNDLE! Let me know if you try música miércoles! As I have mentioned before I am the one woman Spanish show, aka the only world language teacher in my district. This means that planning all four levels of curriculum is all up to me. My first year my goal was to have the next week planned by the time I left school on Friday. This made for a lot of hastily planned lessons after school on Friday as I desperately wanted to go home and start the weekend. Each unit went something like textbook vocabulary, vocab quiz, textbook grammar, grammar quiz, review, textbook test, repeat. I knew there had to be a better way, but I was just trying to stay afloat and make it week to week and all my student teaching and previous experience followed that boring pattern. 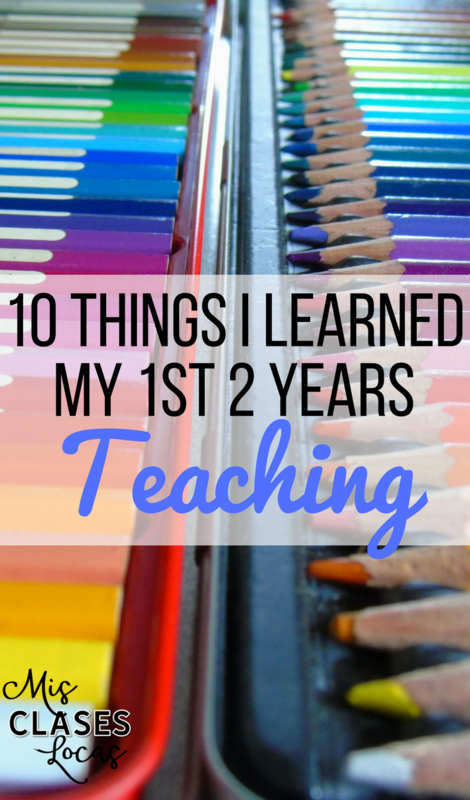 I spent the next summer trying to get ahead, as well as working towards a proficiency based curriculum. Thanks to many blogs I worked toward crafting "I can" statements for each unit. I also started planing whole units at a time with the end proficiency based assessment (not textbook test) in mind. Making the transition to planning a whole unit at a time was HUGE and makes so much more sense! I am nowhere perfect, but learning and growing these past two years, now my process goes something like this. 1. (I used to) I fill out THIS FORM from the Creative Language class for each "I can" statement. This makes sure that I am covering reading, writing, speaking, listening and plan the assessment right away. I usually have more ideas listed than I actually implement, but it is always better to be over prepared! 2. Using all of these forms, I roughly figure out which activities will be completed each day using the school calendar on my day by day lesson plan think through. 3. I input my activity plans for each day in my weekly lesson plan template. (Please excuse the formatting in Drive, usually it fits nicely on 2 pages). This is the form that I keep in the front of the room, which helps me to quickly transition between four levels of Spanish back to back, as well as see the whole week at a time. 4. Implement lesson, take notes and revise for next year! You can get all of my planning templates here. 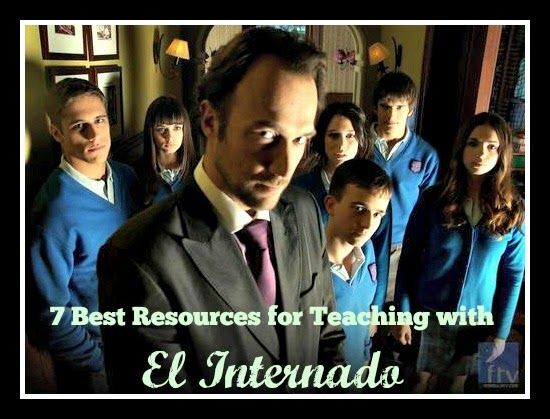 **See all of my El Internado resources sorted by episode HERE! I am sorry for being absent this past week. I spent nap time (AKA my free time) watching the entire season one of the Spanish TV series El Internado. I understand the craze now as I am absolutely hooked. I first became interested as I saw so many of the Spanish teachers I follow on Twitter talking about using the show in class and watching it for their personal use. I bought the whole series on Ebay both to watch myself and with the intentions of using it in my Spanish III & IV class next year. As I have been watching it on my laptop, I have also been taking notes, as well as investigating how other teachers have been utilizing the series in class. I thought I would compile the best resources I have found so far. In no particular order here are the seven best resources I have found so far. Mike Peto's El Internado resources page - His blog has a gold mine of resources for teaching with El Internado, especially for introducing it to novice levels and going very slow. This page breaks down links to lessons, activities, and suggested previous vocabulary by season and episode. 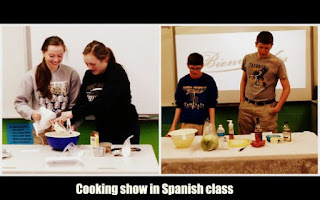 Aventuras Nuevas - She has a great blog post describing the show and how she uses it in class. The best part is the link to the awesome unit about Ratoncito Peréz, which goes perfectly with episode 5 of season 1.
kplacido.com - Kristy was using El Internado way before it suddenly became "cool." I love the parent permission slip she shares in the comments of this blog post. Learning Spanish with El Internado wikispace - A group of Spanish teachers started this great wikispaces with resources sorted by episode. Why reinvent the wheel when others have resources that work? 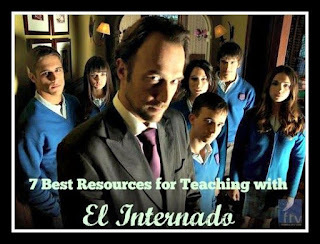 Dustin Williamson's El Internado Page - Here is another blogger who generously shares his resources for using this series in class. They are sorted by episode and include a lot of wonderful reading summaries, as well as a final to use with season 4. Los Personajes de El Internado - This is a "Lista" of 20Minutos.es meant to have people vote and rank the characters of the show. It would be a great resource for students to be able to read about each character, as well as they would enjoy the interactive option of voting for their favorites. Langcamp Wiki - Getting Started with El Internado - This amazing resource is a compilation of El Internado resources and it is just getting started. The best part is that there are going to be Google+ hangouts this summer discussing and sharing how to use the show in class, talk about relevant PD! If you have other resources, please share! For the last unit of the year in Spanish II, we focused on something that they have a huge interest in, FOOD! We did a lot of activities from Kara Jacob's wonderful La Diversidad de la Gastronomia Unit, as well as many from the awesome Zachary Jones. We also utilized my laminated authentic recipes, food ads, and restaurant menus a ton. **I would highly recommend getting a personal laminator. It is a great way to preserve and use all of the colorful & authentic materials you get from magazines and traveling. I know have hundreds of 8x11 laminated sheets sorted by topic that I can pull out to use for many different things. For example, in this food unit, I spilt the class in four groups each with a stack of laminated recipes in Spanish. We had a timed competition for which group could write down the most commands found in the recipes (bate, mexcla, horna etc.) Then groups traded their lists and other groups edited and counted to make sure that there were not any repeats and that all words listed were actually commands. e then created a master list on the SMARTboard of the words they though would be the most useful for their cooking show. This was their introduction to cooking words, and how they came up with the vocabulary they would need for their cooking show. (We also used the laminated authentic materials to come up with our food words at the beginning of the unit). The presentational speaking assessment for the unit was creating a cooking show of an authentic dish, either on video, or live for the class. They also had a presentational writing component of writing up the recipe of what they were cooking as well. The project description can be found HERE. The kids had a great time sampling all of the authentic foods that were brought in including: churros, tortilla española, aguas frescas, Mexican wedding cookies, and many more. My number one summer goal is to spend as much quality time with this little guy as possible, while I am home with him. My hope is that this time is also spent immersing him in Spanish, since I am his primary source of learning the language. (Neither our daycare provider or dad speak Spanish.) I am by no means an expert, and am very new at this with our 4 month old but here is how I am attempting to have a bilingual baby someday. Mom speaks to baby in Spanish (as much as possible) & dad speaks to baby in English. 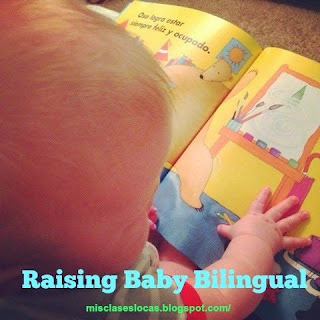 Read books to baby in Spanish. We have purchased books in Spanish, but we also borrow them from the library. Additionally, sometimes I will just use a book in English, but translate it myself. It is just as important to just talk about the pictures you see in Spanish as well. Tell baby about your day in Spanish. When I would pick the little guy up from daycare, I would just tell him what I did, as well as ask him questions about his day. Sing songs in Spanish. Since I did not grow up learning Spanish, I did not know many children's songs (besides the ones I sing with students), so I bought a book of nursery rhymes and children's songs in Spanish. Also, YouTube is a great source as well. Describe the world to baby in Spanish. When we go on walks I often look like a crazy lady jabbering away to him about what we see, hear and smell. Join a bilingual play group. This is not something I have found yet, but if anyone knows of one in the Cedar Valley area in Iowa let me know! Am I worried that he won't speak English, or will be behind? No. Do I think that someday he will be grateful that he was given the opportunity to learn two languages from birth? I hope so. I would love any help or advice from someone who has their own bilingual baby! 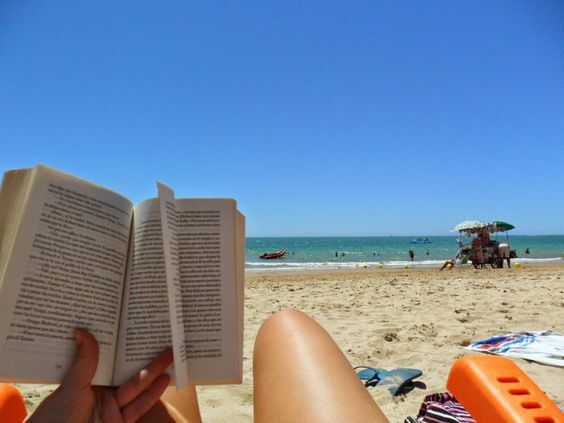 Today is my official first day of "summer break," and you know all I can think about? How I can make next school year the best year yet! Yesterday I made two huge strides forward with tweaking my curriculum for next year. I purchased the complete series of El Internado on Ebay. I plan on binge watching it this summer during baby boy's naps & collaborating on ways to incorporate in class via the Lang Camp Google+ Community. I am excited to see what all the hype is about and find ways to incorporate it in my higher level classes. The school approved purchasing four class sets of TPRS novels, as well as the coordinating Teacher's Guides! I am getting La Calaca Alegre, Brandon Brown Quiere un Perro, Robo en la Noche y Esperanza. If you read this post, you know that I read all four of these books last weekend, so when we needed to fill out a purchase request this week for new materials, they were obviously the ones I picked, since I loved all of them. Now comes the hard part, figuring out how all four of my levels of Spanish will play out over the course of the year. I also need to still find ways to incorporate the only one year old Avancemos! textbook series as well. Being a department of one is both a blessing and a curse, since I have the freedom to completely change my curriculum from year to year, but also the single handed task of doing so. Lucky for me I have found an AMAZING PLN with the #langchat group on Twitter, as well as many generous bloggers who freely share their wisdom and resources. So here is my question for you. How have you structured your curriculum to blend elements such as authentic resources, textbook, TPRS novels & El Internado? Would you suggest breaking it up by days (novel Monday, El Internado Friday etc), units (read a novel everyday until finished with unit, then move on to another), or some other hybrid format? I would love feedback! This year as a part of our volunteering unit in Spanish III, I wanted to find a way that our students could give back. Our Campus Minister at school brought up that the elementary school in Guatemala that she was planning a mission trip to this summer was in desperate need of children's books. So my class set out to write their own books for the children. Most of the books came out wonderful with excellent illustrations and creative story lines. Unfortunately, some had little effort put into them, and black and white typed pages were all that were turned in. Below are my ideas of how I would change/improve this project for next year. Wait to do this project until second semester where the students have had more exposure to the past tense and feel more comfortable using it to write stories. Have more opportunities for students to peer edit and a "final rough draft" that is submitted to me to correct before they go through the effort of illustrations and printing in color when there are still many errors. Have students spend more time reading tprs and children's books from my classroom library before and during the writing process. Have these books serve a dual purpose and also submit them to be a part of Mike Peto's fvr class library project. Show students pictures from this summer's trip to Guatemala to show them that these books will be read by REAL PEOPLE. Any more ideas of how to improve this project for next year? This past weekend was a rare one at my house where we had Zero plans, which meant no work, no travel, and no visitors. It. Was. Awesome! This combined with my 4 month old baby boy's new skill of actually napping in his crib for more than 30 minutes at a time meant that I had free time to myself for one of my favorite things to do, read! I took this rare chance to lay out in my backyard and finally read some of my tprs books from the sample packs I purchased in February as a part of my classroom library grant. My goal is to try our at least one tprs book in each level next year, so I need to start reading to figure out which books to use. 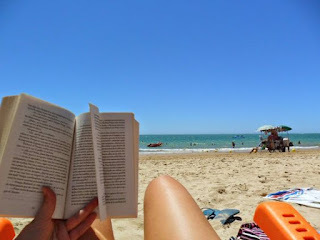 I planned on just skimming through them, but instead I was totally engaged and over the course of the weekend read FOUR of them cover to cover: La Calaca Alegre, Brandon Brown Quiere un Perro, Robo en la Noche y Esperanza. I now finally get why these books are so popular right now, they are actual stories with real plots, cliffhangers, great cultural settings and relatable characters. I can not wait to read more of them! Now I need some help. What books should I use, and for what levels? I teach Spanish 1-4 and would like to try at least one in each class. Any advice would be appreciated!